Real talk: not all who work from home have a control over their time. I am among those who work at home with on a scheduled working hour. I have to be online Mondays through Fridays from 9 AM to 5 PM US Eastern time (that’s 9 PM to 5 am PH time during daylight savings and 10 PM to 6 AM during standard time). Here’s what happened yesterday: it rained hard around 4:30 to 5:30 PM, just a few minutes after we went home from the grocery store. Yay, bed weather is coming! We were all happy for the rain since it was too hot yesterday. Everything was great until we had a brownout. Apparently, it’s a transformer issue that’s causing the power outage. Our neighbors called the people in charge to have it fixed but they were told the outage could take 4-6 hours. 1. My cell phone that’s LTE capable for the internet connection. It has a dual sim functionality. I have a Globe 3G sim in it in case my Globe LTE wifi subscription fails and I have a Smart LTE 4G sim in case there’s a problem with Globe in our area. 2. My Asus 10, 050 mah power bank. It was not fully charged but it can recharge my phone twice while I use it for my internet connection. 3. My laptop with the battery fully charged. My laptop is almost 3 years old but it’s still working well. The notification prompted the battery could last for an hour and 45 mins. That’s really not enough to cover my 8-hour shift but that is enough while I wait for the power to be back. 4. Dane’s laptop. Thankfully, Dane sent the laptop that he bought in KSA. I was planning on using it last night in case my laptop’s battery drains and there’s still no electricity. Thankfully though, the power came back at around 10:04 PM. What’s the difference between working at home and working in the office? You rejoice when there’s a technical issue in the office while you end up scratching your head when there’s a technical difficulty while working at home. To have a backup is essential for WAHMs like me and work at home folks in general. Backups are a great help during unforeseen circumstances such as power outages. If you are taking calls, have at least two working headsets. I only had one headset before and it was always frustrating when the headset stops working. If you are not taking calls, have a backup of everything that you need at work such as your internet connection, computer, mouse, etc. Do you work from home? What is your backup? As a WAHM myself, I can definitely relate to this. Although I don't have a fixed work schedule, I do have deadlines that have to be met and so having back up plans is always a necessity. If we are caught unprepared, we run the risk of being seen as unprofessional by our clients. These are great tips gaw! Definitely a huge help for WAHM out there! I agree, ang saya saya kapag brown out sa office pero kapag wahm ka parang masisiraan ka ng bait hahaha. Don't forget to charge all your laptop battery gaw everyday. It is very important specially for you who are working overnight. Mabuti at bumalik din ang power after ilang mga hours. Geez. I remember when I was still starting my work-at-home venture, my laptop suddenly run out of battery and even I plugged it in, it wasn't charging! That's the most stressful event of my WAHM life. I, being new to my client's company, have only one laptop to use which got broken all of sudden… You can just imagine how rattled I was! I head on to the nearest mall and got myself a new laptop – para lang maka-work! Jusmiyo! Hahaha! I used what's left from my backpay sa previous company ko. Then pag-uwi ko, biglang ok na yung old laptop ko! Nagcharge na sya bigla. I really can't explain what happened. Inisip ko na lang, oh well. At least now I already have two laptops and the other one will serve as my back-up. 🙂 We also have pocket wifi in case our internet provider went nuts. Hehe. Super important to have back-up when you're a WAH Professional, noh? One thing I'm aiming is to buy a really good power bank in case of emergency power outage. Super important yan in this age of technology. It is really important to have back ups. But havent done anything re that. This post might be really pushing me to make backups na talaga.. thanks for the reminder. Haha! That was before. Ngayon, tamad na ako mag events. lol. Tama gaw! Sakit sa heart pag nagka tech issues sa bahay. Pero pag sa office keribels lang, laki pa ng ngiti! haha. Yes, gaw! Hirap pag walang kaback up back up e.
Wow! Grabe experience mo! haha. Pero you're right, at least meron kana back up. Re: power bank, try Asus, more than a year na sakin and it's still working perfectly fine. Ako dati, pag nawawalan ng net, kumakatok sa kapitbahay, nakiki connect! Kakaloka! haha. You're welcome! Bibili na 'yan! Bibili na 'yan. hehe. Backups are so important. Mapa-files man yan or power. That's why laptops are great for WAHMs kasi you can charge it. Sa mobile phones naman, I make sure na mayroong enough battery for calling lalo na kung may bad weather announcement. Good thing you are fully ready in situation like this. 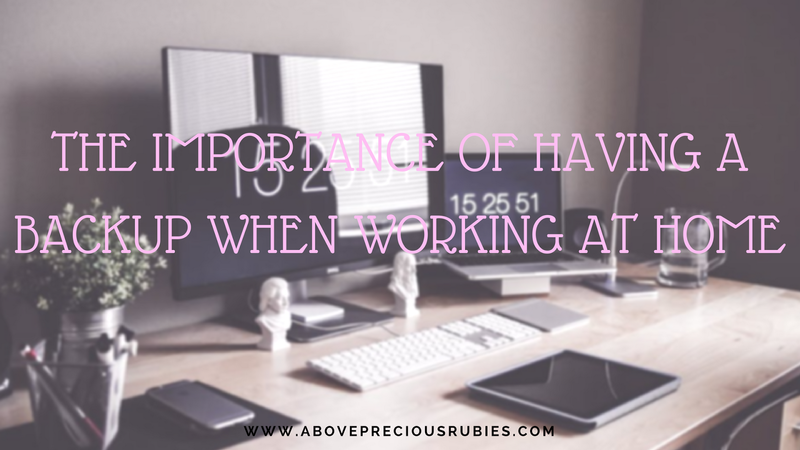 Yes, working from home is very different because you rely on your own resources and independently do all the work, manage your own time, and there's no excuse for not getting things done. Oh that difference between working at home and working in the office is so true. Hopefully I can work at home na soon. Wala pa din kami helper/yaya until now. If we can't find a relative to help us, huwag na lang. I have had enough of abusive helpers. Yes, you're right! Kasi pag PC, walang battery. I wasn't before. I'm happy that now I have a backup. That's right, sis! With all the reports about yayas now, nakakatakot na talaga kumuha ng mapagkakatiwalaang kasambahay. I'm very impressed with how you handled the problem so you can continue your work at home job. I've been thinking of back-up options. Before we have solar power at home, kaya we have electricity even if our neighborhood doesn't. Kaya lang nasira yung solar battery. We really need to save aside money now to have it fixed. I've been thinking of that one as well, kaso db mahal daw ang solar power. I'm considering buying a generator in the future.